Overnight X’mas celebrations with 3 years old! 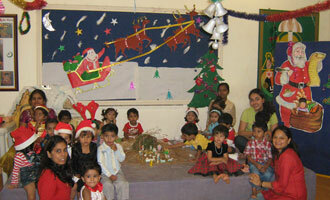 275 MET Rishikul Vidyalaya tiny tots had a sleepover party to celebrate Christmas all night long with Santa Claus! Home > Campus News > Overnight X’mas celebrations with 3 years old! 275 MET Rishikul Vidyalaya tiny tots had a sleepover party to celebrate Christmas all night long with Santa Claus! MET Rishikul Vidyalaya, Principal – Ms. Mallika Kotian believes in celebrating all the festivals in a very unique and fun filled way. On December 24, 2008 all the children stayed back overnight at school. There were theme rooms full of fun, entertainment and games.